These YUMMY Lemon Bars are one of my many findings on Pinterest. Everyday, I would see their amazing picture and everyday, I would wish I was eating one. So, here they are! They are super tasty. They are chewy, creamy, lemony and they melt in your mouth (yes that is all possible in one little bar)! Delish! Combine cake mix, butter and egg. Press into a 9x13 inch baking pan. In a medium bowl, beat cream cheese until smooth. Add the powdered sugar, grated lemon zest and lemon juice. Mix well and reserve 1/2 cup for a later use. Add eggs and vanilla extract to remaining cream cheese mixture. Mix until completely combined. Spread over cake batter. Bake at 350 degrees until set, approximately 25-30 minutes. Cool completely. Spread reserved cream cheese mixture over the top. Refrigerate until firm. Cut and serve. Keep refrigerated. Jenn's Notes: I omitted the lemon zest, because I had several, already zested, lemons leftover from my fave zucchini muffins, so I just added the juice and they had a great fresh lemony flavor. I baked mine for 30 minutes and they were slightly overbaked, so the bottom was a little dark, but they were still very very yummy. You want to bake them until the top is no longer jiggly, but be careful not to overbake. YUMMY! These are so pretty! I am appreciative of your honest notes. I am not a big baker, but this is a very easy recipe so I will give it a try and having your notes will help. So nice to visit you! These look easy and delicious. I need to take a recipe of bar cookies to a function and I just found what I am going to bring. Thank you so much. 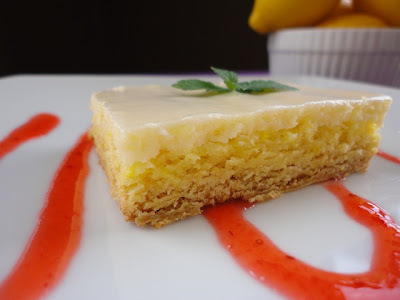 This looks like a very good dessert recipe that I have to try! Oh my goodness, these look delish! I am dying over all your recipes!!! Thanks for stopping by so I could follow you to your blog. Love it and am now following so I don't miss out on any of the goodness! It is so much fun seeing all the fun things that are on Pinterest! I wish I had time to make them all! These look great - I am a sucker for any kind of dessert with cream cheese in it. I would love it if you shared this on my blog party, Makin' You Crave Monday, over at MrsHappyHomemaker.com!! These look very tasty! 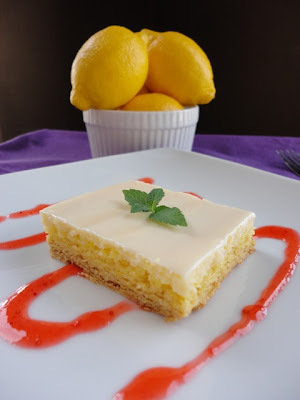 I love lemon bars! I really LOVE lemon, these look amazing!